At the time of its release, Joan Baez's debut album was something of a revelation. The folk music revival was beginning to gather steam, stoked on the popular side by artists such as the Kingston Trio and the Easy Riders, as well as up-and-coming ensembles such as the Highwaymen, and on the more intense and serious side by the Weavers. The female singers on the scene were mostly old-time, veteran activist types like Ronnie Gilbert and Malvina Reynolds, who was in her sixties. And then along comes this album, by a 19-year-old who looked more like the kind of co-ed every mother dreamt her son would come home with, displaying a voice from heaven, a soprano so pure and beguiling that the mere act of listening to her — forget what she was singing — was a pleasure. Baez's first album, made up primarily of traditional songs (including a startling version of "House of the Rising Sun"), was beguiling enough to woo even conservative-leaning listeners. Accompanied by the Weavers' Fred Hellerman and a pair of session singers, Baez gives a fine account of the most reserved and least confrontational aspects of the folk revival, presenting a brace of traditional songs (most notably "East Virginia" and "Mary Hamilton") with an urgency and sincerity that makes the listener feel as though they were being sung for the first time, and opening with a song that was to become her signature piece for many years, "Silver Dagger". The recording was notable at the time for its purity of sound, and Baez's voice soars with an awesome purity of "Fare Thee Well", "House of the Rising Sun", and "All My Trials", and the guitar accompaniment on "Wildwood Flower", among other tracks, comes through with richness and clarity. 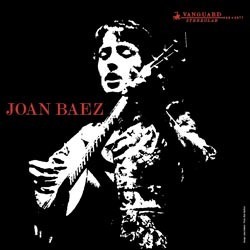 The 1960 release of Joan Baez' self-titled debut album featured thirteen traditional folk songs, including definitive readings of "All My Trials", "Silver Dagger", and "Fare Thee Well". Most of the songs featured only Baez' vocals and intricate guitar work, with a second guitar added to a handful of songs. Despite the lack of strings and horns, backup singers and catchy singles, the album went gold and raised Joan Baez to superstar status. "Based upon the diversity of music, quality of product and their extraordinary rate of progress, Pure Pleasure Records is our re-issue record company of the year."